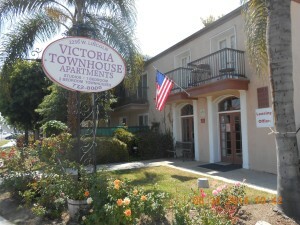 Victoria Townhouse Apts., is nestled on the west side of Anaheim. Our community is surrounded by good schools and famous attractions: Disneyland/California Adventure, Knott’s Berry Farm/Soak City, Angel Stadium and the Honda Center. We offer spacious Studio, One bedroom and 2 bedrooms Townhomes. Water, trash, and sewer are paid. We also provide assigned parking for all units. For our residents’ convenience, we offer laundry rooms, recreation room for private parties, and great sparkling pool. Close to highway, just under a mile to the 5 FWY and 2 miles to the 91FWY. Come by today and tour your new home. No appointment necessary. Come see us soon! COPYRIGHT © 2016 VICTORIA TOWNHOUSE APARTMENTS, LLC. ALL RIGHTS RESERVED.